The Liverpool Scene were one of the hardest working bands out there in the late 60s and early 70s and a huge favourite on the college circuit. In 1969 they toured with Led Zeppelin. The photo (left & above) is of Liverpool Scene and members of Blodwyn Pig on stage jamming with Led Zeppelin during their encore of 'Long Tall Sally'. This was the opening night of the Pop Proms at the Royal Albert Hall in London. 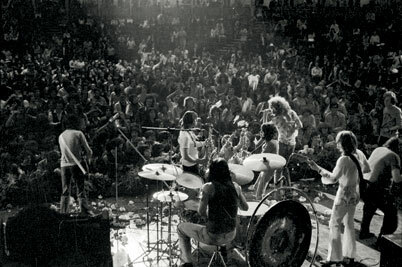 The day before all three bands had appeared at the very first Bath Blues '69, which became the inspiration for Michael Eavis to start up the Glastonbury Festivals. There are photos available which show Led Zeppelin singer Robert Plant and bassist John Paul Jones wearing Bobby and the Helmets t-shirts! 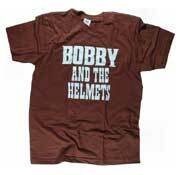 That’s no coincidence – they must have put their heads together and decided to wear Bobby shirts as a kind of uniform! "Which places Liverpool Scene at the beating heart of heavy rock!" *Playhouse Theatre – London for the BBC?